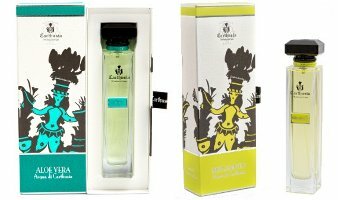 Italian niche brand Carthusia has launched Acqua di Carthusia, a quartet of fragrances based on the scents of Capri: Aloe Vera, Bergamotto, Geranio and Zagara. Acqua di Carthusia Aloe Vera (shown above left) ~ "On Capri, Aloe Vera has always grown wild and untouched along the sides of Via Krupp, the magnificent path nestled into the rock that leads from the Augustus Gardens down to Marina Piccola, or up to the enchanting view bordering the gardens of the Charterhouse of St. James. During our search for inspiration all over the Island, Carthusia was pleasantly surprised to notice that such powerful and impervious natural beauty could hide a soul so soft yet full of vitality, and so rich in healthy properties as to be called “the plant of life” by the ancient Egyptians. After having extracted its precious fluids, we tempered its wild qualities with Lavender flowers, Geranium and Jasmine, creating the latest magic potion to come out of Capri’s native plants: Acqua di Aloe Vera. An eau de cologne of intense and purifying energy, its vigorous fragrance softened by the notes of Elemi, Artemisia and Cardamom, releasing restorative sensations that delicately fade into an elegant potpourri of Cedar Wood, Sandalwood, Musk and White Amber tones." Acqua di Carthusia Bergamotto (shown above right) ~ "On Capri, the scent of citrus is everywhere, like that of the sea. Whosoever lands on the island may find Bergamot orange trees neatly lining the paths of the villas, or else cropping up from behind walls along the inland roads, their dense dark-green locks betraying here and there an intense yellow colour and a captivating fragrance. It is that very scent that inspired Carthusia in its search for new seductive elixirs from Capri’s wild nature, which as always, has born its fruits: Acqua di Bergamotto. The active freshness of Bergamot is enhanced by the Orange, Lime and sunny Angelica that wash over the senses in a wave of lively euphoria that is softly transformed into a bouquet of Jasmine, Clary Sage and Star Anise, eventually acquiring the sober elegance of the base notes, in tones ranging from Cedar Wood to Amber. A fragrance that expresses the boundless exuberance of Capri, allowing one to experience its colours, its lights and its atmosphere as if in a waking dream." Acqua di Carthusia Geranio ~ "On Capri, the wild geranium keeps you company as you enjoy the island’s walks, overlooking onto the paths from the picturesque cliffs above, and blooming amongst historic areas, right up onto the balconies of the houses where throughout the years it has been tamed and cultivated. Its unabashed presence here has stimulated Carthusia’s imagination, who has always turned to Capri’s wild and beautiful nature to enrich its choice of fragrances with fresh sensations. In Acqua di Geranio, the essence of Geranium gently radiates its relaxing properties following the Lemon and Calamint that arrive ahead of the heart of the fragrance, just as the clear and refreshing light of dawn heralds the beautiful and sunny days ahead. The elegant balance of the Cedar Wood and White Musk in the base notes continue to cradle the senses in a dreamlike atmosphere, while maintaining a vibrant feeling of well-being. Acqua di Geranio recalls the emotions given by red, rose, fuchsia, violet and all the radiant shades of this lively and cheerful native plant of Capri. Acqua di Carthusia Zagara ~ "On Capri, between April and May, the Zagara blossom comes into bloom. Soft as snow, its flowers give a white coating to all the island’s gardens, heralding a clear and candid season. The feelings it gives, though, are the warm ones of amorous encounters under the sun and the stars, of the azure reflections of the sea in the caves and the scent of barbecues and limoncello, whilst in the background, coming from a villa in the distance, echoes the melody of “Luna Caprese”. The joy of living amongst nature reverberates all over the island, mingling with Carthusia’s creativity, which has always transformed the marvels of Capri’s wildflowers and plants into magical sensations. At the heart of Acqua di Zagara, Orange Blossom and Jasmine melt into an exhilarating concoction that makes for a mesmerising yet relaxing experience. Notes of Lemon, Mandarin, Bitter Orange Blossom and Ginger wet the appetite of the senses, stimulating them with refreshing, carefree enthusiasm that subsides into a combination of Cashmere Wood and White Amber, whose notes emerge from its base like sweet and seductive words that one never tires of hearing." Acqua di Carthusia Aloe Vera, Bergamotto, Geranio and Zagara are available in 100 ml and in matching body products. I really like this line but it’s pretty underrated. I definitely want to samples these four Acquas from Carthusia. I would love to be in Italy, sampling all these scents!! They got me at Via Krupp – I’ll try them all and I’m pretty sure I’ll get a couple! I can’t figure out the concentration, but they do list them under their body product line instead of under concentration, as they do their other fragrances. So guessing cologne.